TROY , MI – Dirty deeds are done dirt cheap in this “discovery from Down Under”. THUNDERSTRUCK is an Australian comedy about male bonding fueled by rock ‘n roll and forged on a road trip across the Outback. Starring some of Australia ‘s finest up and coming actors, the film follows the journey of four lifelong mates who strive to fulfill a pact, to inter one of their recently deceased friends…right beside the late AC/DC frontman Bon Scott. The DVD also includes the film’s theatrical trailer, the featurette: Making THUNDERSTRUCK, audio commentary with director Darren Ashton and producer Jodi Matterson, as well as some of the film’s deleted scenes. 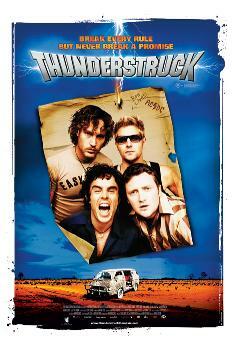 THUNDERSTRUCK will be available for the SRP of $19.98 on September 6, 2005. It’s 1991, AC/DC’s Razor’s Edge tour, front row. Five buddies–Ronnie, Sonny, Sam, Ben, and Lloyd- share one common devotion: the hard rock band AC/DC. During the show, Sonny is thrust onto the stage by his mates, diving right back into a frenzied crowd. The band’s legendary lead guitarist Angus Young tosses Sonny his cap in appreciation and the night couldn’t go any better, until the mates try and crash the after-party, only to be tossed out promptly. Returning home, the mates look up to see a 1978 poster of AC/DC’s deceased frontman Bon Scott. This brief delay appears to save the boys , as their impatient taxi driver leaves them behind and fatally crashes his car . The friends become convinced their devotion to the band saved them from sure death. Relieved and rejuvenated in their devotion to the band, the boys make a pact: The first of them to die will be buried by the other four alongside the grave of their hero, Bon Scott. Many years later, they’ve grown apart, frustrated with how life has progressed unfavorably, but none forget the pact made that night. When Ronnie is killed by a freak lightning bolt, the four remaining friends reunite, and motor his stolen ashes clear across the country, to Bon Scott’s grave. On the way, the buddies run into all that’s bizarre in the Australian Outback, and rekindle that rock ‘n roll flame that forged their friendship all those years ago. THUNDERSTRUCK stars some of Australia ‘s hottest new talent including Damon Gameau (The Tracker), Stephen Curry (The Castle), Ryan Johnson (The Wannabes), Callan Mulvey (Heartbreak High), and Sam Worthington (Dirty Deeds). The film is directed by Darren Ashton, produced by Jodi Matterson, executive produced by Al Clark and Andrena Finlay and written by Shaun Angus Hall and Darren Ashton. An official selection at the 2005 South by Southwest Film Festival, the film also includes a cameo by Australian Premier and AC/DC devotee Geoff Gallop. The film was distributed in Australia by Mel Gibson’s Icon Films. The deal with Anchor Bay was negotiated by David Garber and Robert Lynch of Lantern Lane Entertainment. Anchor Bay Entertainment is an established leader in the field of home entertainment. The company offers an expansive selection of award-winning, notable theatrical films including “Time Bandits” and “Halloween,” classic television programming such as “3 rd Rock from the Sun,” “Three’s Company,” “Highlander” and much of the Stephen J. Cannell library, traditional children’s fare featuring the ever-popular Thomas & Friends collection and Mister Rogers Neighborhood, the impressive Manga anime line and chart-topping fitness titles including the “Crunch” and “For Dummies” series. Anchor Bay Entertainment is aggressively developing a wide range of original programs and concepts in addition to licensing existing brands and films. Anchor Bay Entertainment is a subsidiary of IDT Entertainment. IDT Entertainment is a vertically integrated entertainment company that develops, produces, and distributes proprietary and licensed entertainment content. IDT Entertainment is a subsidiary of IDT Corporation (NYSE:IDT, IDT.C), an international telecom, entertainment, and technology company.